A new memoir by Isaac “Ike” Glick ’55 and Mildred “Millie” Alger Glick, class of ’55, Risk and Adventure: Community development in Northern Alberta (1955-1970), highlights the work of Mennonite Voluntary Service participants (MVS) in Canada from 1955-1970. An estimated one-third of approximately 100 people involved in the program were Eastern Mennonite College graduates, according to J. Daniel Hess ’59. The memoir features stories of MVS work in Alberta, accompanied by photos, maps and several first-person narratives from former colleagues. Mike Cardinal, the first indigenous Albertan to serve in government office, held five ministry positions and recalls the Mennonite influence upon his childhood in Calling Lake, as does Professor Emma LaRocque, a Metis who benefited as a young girl from alternative schooling opportunities and remains a lifelong friend of the Glicks. Unlike the United States, which has never formally recognized the damage its legacy of “Indian Boarding Schools” has caused generations of Native Americans, Canada embarked in 2008 on a National Truth and Reconciliation Commission. That commission ended in 2015. “This book can be very helpful as we all seek to build bridges and seek ways to help implement the 94 calls to action of Canada’s Truth and Reconciliation Commission,” said Jim Shantz, co-coordinator of Indigenous Neighbors for Mennonite Central Committee (MCC) Alberta. In 1955, Ike graduated from EMC with a degree in Biblical studies and theology. Millie had graduated from Eastern Mennonite High School and completed one year of college. Unsure of their future, they volunteered for a two-year term with MVS, leaving their native Pennsylvania (Ike) and Virginia (Millie) far behind. The couple stayed in Calling Lake for 10 years beyond their two-year term. They lived in an isolated village of about 300 inhabitants, at the end of 45 miles of dirt road surrounded by the bushland of northern Alberta. 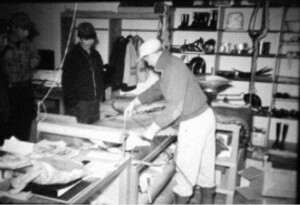 Ike Glick measures a beaver pelt at the fur trading post at Chipweyan Lake. “It was not difficult. It was different,” Ike says, of their life. He learned to fly a plane to reach settlements without road access. Millie learned to cope with wood stoves. Those 12 years changed their lives forever. The couple now lives 150 miles south in Edmonton. They first wrote memories of their time in northern Alberta to share with their children. Hess encouraged them to add photos and to publish the book for a broader audience. The MVS unit’s task was “largely undefined … to help people help themselves,” Ike Glick writes, quoting Ray Horst, then a unit director in his second year of what would become a long career working for social justice issues and with indigenous people with Mennonite Board of Missions. Fred Gingerich ’57 with 17 students at Sandy Lake. 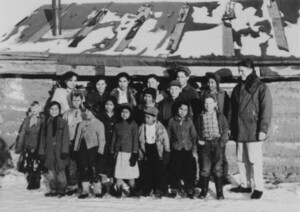 During their time in Alberta, the Glicks, along with many other MVS members, engaged indigenous communities within a large radius of northern Alberta, helping to build, populate and teach in schools; to build and staff public health centers; and to help create sustainable economic opportunities. This included traditional beaded leather crafts and canoes. A small sampling of the many EMC alumni who eventually joined them includes Roy Hartzler ’59, who spent a summer helping to build a school at Sandy Lake; Delmar Yoder ’61, who started a demonstration garden, inspiring many to plant gardens of their own; and two couples, Fred and Elsie Yoder Gingerich, both 1957 graduates, and Dr. John Rutt and his wife Becky Hartzler Rutt ’59. The Gingerichs lived 50 air miles beyond Calling Lake at Sandy Lake, and then moved another 90 air miles further to re-open a Hudson Bay Company store and eventually a school in Chipewyan Lakes. The Chipewyan Lakes community had been evacuated by the Canadian government and relocated 90 miles away to Wabasca because of village resistance to the policy of children being removed to residential school. 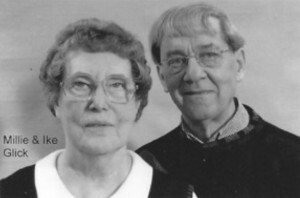 John and Becky Rutt lived three years in Alberta in the early ‘60s, first at Calling Lake where they operated a small clinic and later Slave Lake, where the evident need for a physician laid the foundation for a 40-bed hospital, just as the Rutts were returning to the United States. Significantly, the volunteers built relationships in ways contrary to the traditional treatment of indigenous families at the time. The Glicks raised five children in Calling Lake, as they responded to what they termed “unexpected compelling opportunities.” Eventually Ike was offered a position with the government, working with First Nations people on an economic opportunity project that had grown from MVS support into a larger business called Teamwork Enterprises of Alberta and McKenzie (TEAM). For this position, the family moved to Edmonton. In 1970, Ike enrolled in a master’s degree program in community development. He often felt affirmed about voluntary service initiatives since he could now relate theory with practice. He continued to work with First Nations people for the rest of his career. “The experience was life enriching and life determining for us,” Ike said, sharing that close friendships developed with many of the volunteers and among area indigenous residents. Nearly 40 VSers—those who stayed in Alberta plus a few residents from elsewhere— reunited two weeks ago in Edmonton.